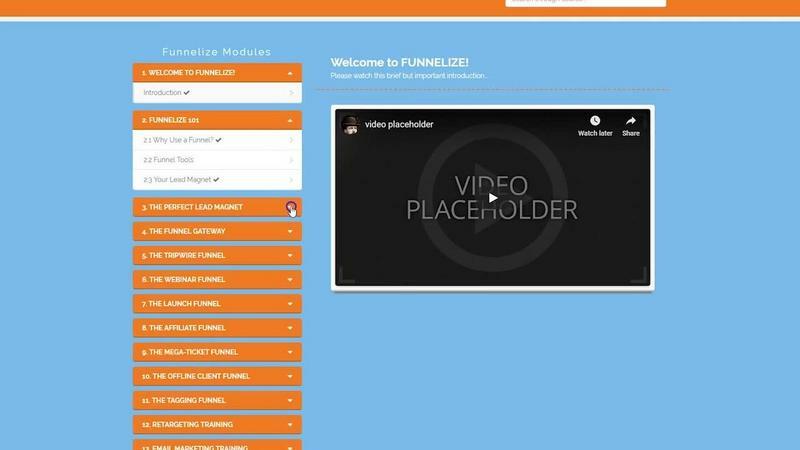 8 Funnel blueprints to follow including case-studies and live demo’s of each! Over 35+ training videos included! Over 25 Cheatsheets and PDFs! Learn to build your email marketing list like the pro’s! Newbie friendly from beginning to end! It’s not! There isn’t some magical shortage of leads that you need to “tap into” – there are hundreds, thousands, even ten’s of thousands of leads for your business regardless of your niche. You could be getting them right now! 2) A step-by-step process where you grow prospects into leads, leads into customers, and customers into repeat customers! The sad thing is, you already have everything required to build this system yourself! …but I want to give you the map to assemble it! The psychological powerhouse of a high converting, lead generating, sale-making FUNNEL! Complete with a ravenous group of followers, an email list of buyers and leads, credibility and authority, and an emotional connection with each of your prospects. I hear this myth all the time and it drives me crazy! A funnel is just a collection of pages online. That’s it! You can build a funnel using a free WordPress theme, a free drag n’ drop page builder like Wix or Squarespace, or build it from scratch in HTML. Tools are great to help you get things done, but it doesn’t mean they’re required. Nope, wrong again I’m afraid! Creating and managing a funnel is actually very easy… It just depends on the kind of funnel you’re using. A MONSTER funnel with 15 steps and multiple stages of retargeting and email follow-ups is definitely tricky! There’s an effective funnel for any experience level!